HAVERING ...Meh: THE SHOW MUST GO ON! ...mustn't it? This was a hugely successful and fun day out - especially for older Cockney residents who moved to Havering from the old East End. For these reasons I can't turn my back on my heritage, and I also can't ignore the political reality facing amateur theatre groups in our borough today. Groups across Havering are on a financial knife-edge when it comes to keeping afloat, and it's only due to the real talent and professionalism of the actors, musicians and directors themselves that ensure their survival. The Queen's Theatre in Hornchurch has provided entertainment since the 1950s. It was the first theatre in the UK to be funded by a local council - a highly radical move in those days! It's come a long way since its humble roots in Station Lane and continues to bring in audiences from across London, Essex and beyond. As a council-subsidised body, it must do all it can to support and help out local groups who want to showcase their talent on the stage of this great institution. Young residents in our borough face fewer opportunities than our parents' generation. Therefore we all need to support local theatre and arts groups as much as possible so that the talent, skills and enthusiasm of our next generation won't be lost to the crippling economic climate. 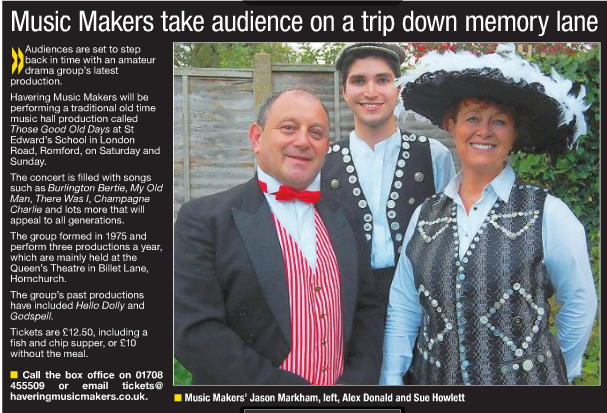 *My next performance will be Havering Music Makers' production of Gilbert and Sullivan's Mikado. Book now for what promises to be a brilliant show!